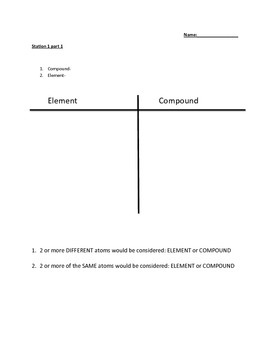 This lesson is a rotation lab where students will apply what they have learned about: What classifies something as an element, what makes something a compound, What is an organic compound, what element must be in a compound to be considered organic? 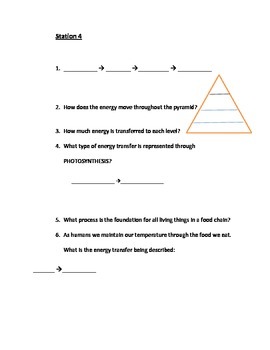 The lesson also has a review about energy transfers and how energy moves through a food chain and energy pyramid. If you want your kids to be up doing something more then just sitting and getting. This is the student sheet that students will fill out as they visit each of the four stations. Make sure you also buy the Rotation Station's that go with the student sheet. Students will be dived into groups from 2-4 the more sets of stations you put out the smaller the groups can be. 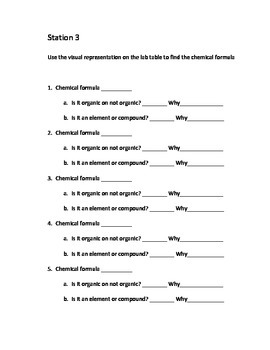 Students will visit each station and fill out the task written up onto the student sheet. Each station can take up 5-7 minutes depending on your students level of readiness is for each station. Once students have visited each station bring the class back to a whole and go over answers for each station to check for understanding. Teacher will monitor back and forth from stations to check on students.